2nd edition of Gambling Investment Database includes 76 potential investors and investment targets in the gambling/gaming industry. The gambling and gaming industry offers a wealth of investment opportunities, and more and more financial investors are increasingly eager to find attractive investment targets. But there is not much information available about investment opportunities in the gambling industry; therefore, this report is intended as intermediary between investors and the gambling industry. 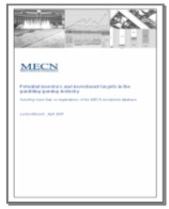 The report mainly features investors and investment targets that are currently registered in the MECN investment database. All companies presented are either financial investors looking for attractive investment targets in the gambling industry or gambling companies seeking funding. In total 16 investors are included (contact details, investment preferences, minimum and maximum amount willing to invest, …). The investors are mainly corporate investors and private equity companies. Top investment preferences among the registered investors are companies in the online gambling and in the land-based casino sectors. The investors represented offer a wide variety of potential investment volumes. Investments start at less than USD 2 million and can range up to a maximum investment of over USD 100 million. In total 60 gambling companies and start-ups are included (contact details, brief description of business, funding asked for, …). Of the companies registered, about 50% are in the online gambling business; the second largest group are technology/service providers, and land-based casinos are the third largest group. Most of the companies are located in Europe, followed by North America. Most companies are looking for funding for the early and the expansion phases and ask for a funding volume of USD 1 to 10 million. Additionally the report includes a comprehensive list of private equity companies active in the gambling/gaming industry, selected investment opportunities in publicly traded companies, and a description of upcoming IPOs in the industry. In case you want to register (free of charge) in our database, please click here. We will collect all new requests and make them available at a later time.